Salisbury Monday 16th February 2015. Naim today confirmed the arrival of a new product in its core range: a performance upgradeable preamplifier including full network audio and zero S/PDIF jitter DAC. The NAC-N 272 streaming preamplifier will be available from Naim’s specialist retailers in March. Existing Naim customers and potential new ones are asking for this combination; but only without the sort of compromise that is often delivered by competitors. Naim’s customers are not easy to satisfy: the product’s performance must deliver that ‘draw you into the music’ character that has been part of Naim for over 40 years. Naim envisages that many customers of the NAC-N 272 will be upgrading from SuperUniti, or NaimUniti 2 if they are already enjoying network audio or from an existing pre-amp like a NAC 202 if they are not. In both cases the likely matching power amplifier would be the NAP 200 or NAP 250. These combinations deliver a very serious system capable of working with most loudspeakers to bring a superbly musical and enjoyable performance. The NAC-N 272 will also bring new customers to the Naim brand possibly initially as a front end to their existing power amplifiers or for someone looking for an extra degree of performance over a Uniti solution without losing out on convenience and functionality. Inputs and music sources include: UPnPTM hi-res streaming, Spotify® Connect, Bluetooth® (aptX®), iRadio, DAB+/FM, 6 digital, 3 analogue and one USB input for iPod or USB sticks. A combination that should be ideal for music lovers. The NAC-N 272 is the first Naim product to be DSD64 compatible. This new feature simply adds to an already rich feature list and allows customers to explore more music from different sources and in different formats. DSD files can be played back on the 272 via the UPnPTM, electrical S/PDIF or USB inputs. The DSD audio routing is kept as pure as possible. The digital header information is stripped out by the DSP leaving only the audio, which is optimised for the DAC by integer resampling the stream at 40bit/705.6kHz, using Naim software to maintain the high sample rate and accuracy. This adapted DSD stream then enters the 24bit DAC, bypassing the DACs internal digital filter. The S/PDIF inputs on the NAC-N 272 utilise Naim’s proprietary zero S/PDIF design using the powerful SHARC processor to buffer the incoming S/PDIF signal and clocking it out of the buffer utilising a precision quartz crystal. The SHARC runs unique Naim-authored software to create an ultra-high precision 40-bit floating-point filter. The filter over-samples by 16 times on 44.1kHz data and provides stop-band attenuation of -156dB. The analogue output includes Naim’s classic discrete five-pole Sallen Key filter. The analogue and digital sections of the 272 are isolated to reduce noise and communicate using fast opto-isolators. Four separate secondaries from the transformer ensure the optimum power supply isolation and also the ideal voltages and regulation for the Analogue, DAC, and two digital rails. The circuit boards are float-mounted to reduce microphony. The NAC-N 272 features a traditional Naim preamplifier section with high-quality hand-matched components. All of the critical components in the signal path are discrete thru-hole analogue parts matched by Naim to within 1%. The 272 volume control is derived from the design featured in the flagship Naim Statement NAC S1 preamplifier. It uses hand-selected, through-hole analogue components which are isolated from their digital controller using optical chips. All the analogue inputs, outputs and mutes are relay switched and completely disconnected when not in use. The relays, in traditional Naim engineering practice, are fed from constant current sources for the lowest interaction and lowest noise. The moment headphones are plugged in the output current drive is automatically increased by five times to give dynamic drive for all headphone impedances. The amplifier runs from a high voltage power supply so has the ability to drive high impedance headphones with the voltage swing they require for open and dynamic sound. 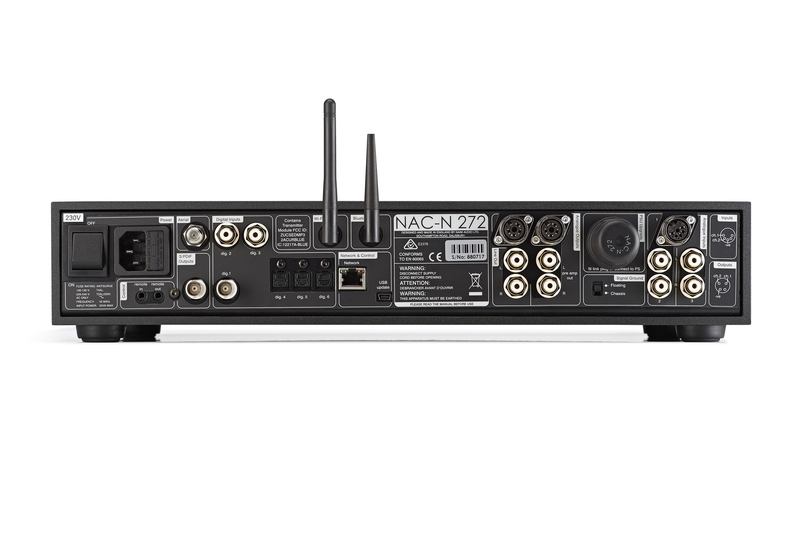 The NAC-N 272 can be upgraded by adding an external power supply. These bring benefits of a lower PS impedance, lower noise, more regulation as well as disconnecting the micro vibrating internal transformer from the preamp. A demonstration is of course suggested but the differences in performance are not subtle. Compatible power supplies are the XP5 XS, XPS and 555PS. Audio Formats WAV and AIFF (up to 32bit/192kHz), FLAC (up to 24bit/192kHz), ALAC (up to 24bit/96kHz), WMA (up to 16bit/48kHz), Ogg Vorbis (up to 16bit/48kHz), MP3, M4a (up to 320kbit/s), Playlists (m3u, PLS), DSF64 and DFF64, Gapless playback supported on MP3, M4A, AIFF, WAV, FLAC and ALAC.